I made a durian mousse cake for my friend's birthday too. Wasn't that good, a too healthy cake. 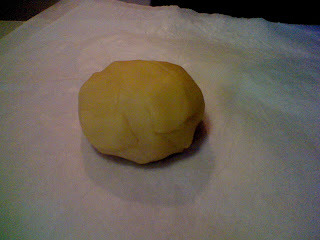 Almost tasted too bland but durian taste was very distinct because it was sugarless. Apart from that, I made some banana crumbles too. But it weren't that crumbly upon cooling and reheating. Hence, I decided not to blog about any of them! Finally, I also made my signature chewy chocolate chunk cookies.However, I experimented with it, twisted it a little, substituting part of the butter for olive oil and some other substitution. All these done just so anyone reading this could have an even more perfect chewy chocolate chunk cookies! However, my experimentation failed and the rest of the stuff made weren't good enough to deserve a post on its own. Hence, I have no post despite all the stuffs I've made and this very first post after exam, in my opinion really deserve a post. 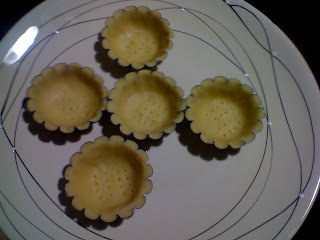 This is my first time attempting to make egg tarts. 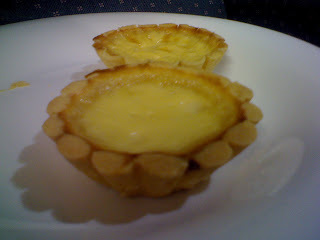 I opted for the egg tart recipe from Jas's Kitchen. I find it not too tedious for a beginner like me and most important of all, it says 'makes 14'. I wouldn't like the idea of making too much egg tarts and only having to serve a few people. Also, I happen to have all the ingredients called for in the recipe so here we go! The shortcut pastry, well chilled from the fridge after having rest for an hour. I like the texture of the dough. Its easy to work with, not too sticky on the hands, need no extra flouring. I rolled them between two sheets of baking paper. Mess free and non-stick, just what I need! 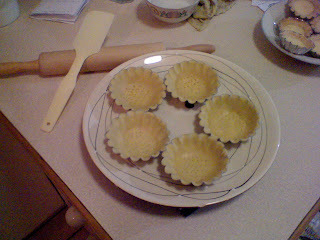 Placing each circle of dough into the mini tart mould. Working it with thumbs and pressing out the excess dough. The dough is nicely fitted into the mould! Repeat this over and over again....It's pretty fun though! 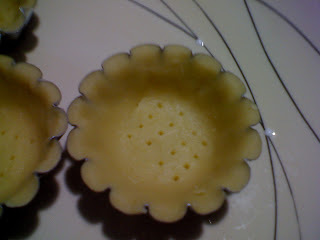 Can anyone tell me am I supposed to prick that many holes in each tart? I dunno, I just got addicted doing it, hehe! Prick Prick Prick! The 5 medium sized moulds nicely lined and pricked! Fresh from the oven! According to Aunty Yochana, do not let the egg custard puff up and wrinkled upon cooling. I took on her advise and use a tong to jiggle the tarts towards the last few minutes of baking. 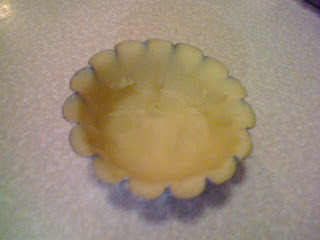 When the egg custard does not wobble upon jiggling, it is cooked and could be removed from the oven. I kinda screwed up a little. The shell is way too thick. Just look at the picture for god sake....Gotta roll it thinner next time. I like the shell though. 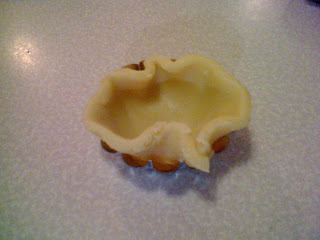 It tasted really good and I love how it holds its shape. Gonna make more mini ones from now one! 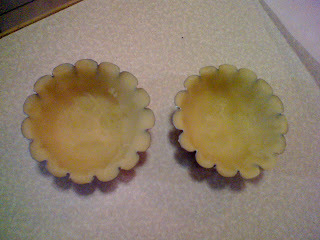 The very next time I make egg tarts again, I'll put a small aluminium square on each of them and put rice/red bean on top of it. Also prick it a little as well, this will ensure no puffing of the shell during blind baking! Next, this is gonna be disgusting, I stirred the egg custard with my CLEAN fingers in order to not create any foam. Well, I suppose one chopsick could do the same trick but I'm more comfortable working with my fingers to make sure I evenly mixed the condensed milk and the eggs. I strain it twice and got the smoothest foamless, bubbless egg custard ever! Verdict, there's too little to go around, I made less than 14 (5 medium sized and 8 mini ones) but it was good. Probably cuz I made it too thick. The mini one was really good! 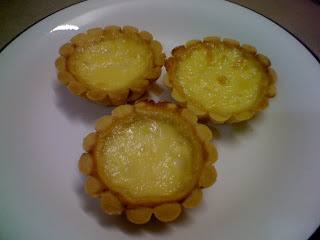 I'm gonna attempt Aunty Yochana's egg tart the next time I bake egg tarts again. Then can tell you people which one taste better! 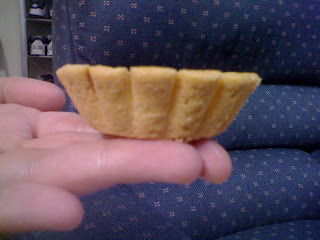 0 comments on "Egg Tarts"